Studies in the medical field are typically based on reams and reams of data. Healthcare is a product that every human needs to consume, and legislation by the government to integrate computers into the clinical setting means collecting that data is an integral part of the process. With mountains of data being collected daily, most studies on drugs or diseases or whathaveyou have a bountiful amount of raw information backing them up. It’s a good thing all this data is being collected too. When clinicians are making decisions about a course of treatment for a patient, you want to be sure they’re working with the best information possible. If a doctor is making a recommendation on a surgery or drug based on recent studies, you want that study to model reality as closely as possible. The less data in the study, the more likely it is to be wrong, which means your doctor is more likely to make a decision that could end up harming you. Data is good! There are always a few people that suffer from highly unique diseases though. Whether they’re pathogenic or psychological, the issues arise so infrequently that there is no plausible way to gather enough data to make statistically-sound decisions. Consider the case of Phineas Gage – back in the 1800’s he had a railroad spike blasted through his head, destroying a big chunk of his brain. Amazingly he survived for another twelve years. This incident was wildly interesting to anyone studying the brain because it gave a rare glimpse into aspects of the brain that were virtually untestable. Yet it was hardly something you could repeat, at least not within a million miles of the hippocratic oath. In these situations the medical community turns to case studies. Case studies are used to examine a single unique event that is basically unrepeatable for whatever reason. While case studies don’t have the statistical significance needed to develop ‘best practice’ decisions in similar situations, they at least provide additional insight for any practitioner finding himself faced with another impossibly rare scenario. Today we’re going to perform our own case study on Goblin Rabblemaster. 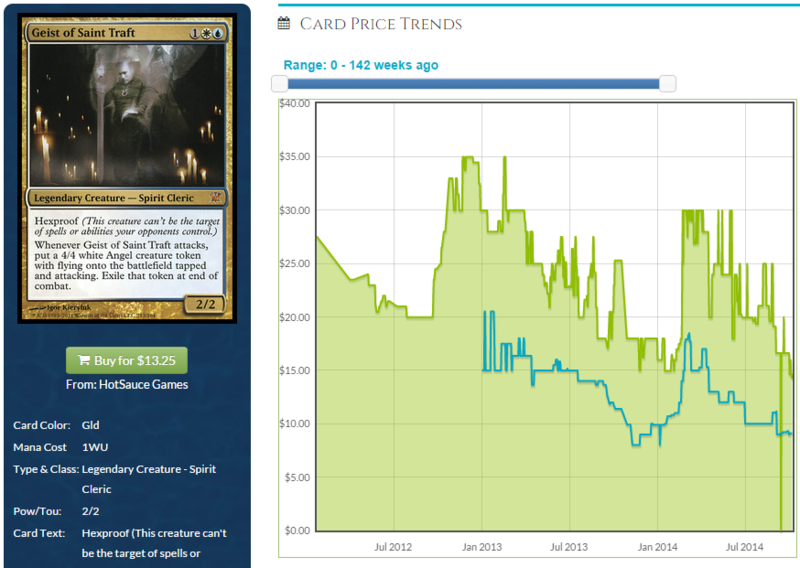 Rabblemaster has skyrocketed to nearly $20 recently, which is pretty wild considering he was under $1 at one point! I want to take a look at various aspects of Rabblemaster, compare that to other creatures we’ve seen in the past, and see what knowledge we can extract from the whole process. Hopefully we can identify a key marker or two that will help us catch the next rags-to-riches creature that shows up. “Dies to removal” was the rallying cry of MTGS posters for years, and possibly still is. (I haven’t read the site in years.) No matter how powerful a creature was, if it was highly vulnerable to removal, it was deemed trash. Indeed, it may not have been an unreasonable rule of thumb quite some time ago, when creatures were generally weaker and spells stronger. I would say it was after M10 when the most Doom Bladeable creature ever was $50 and ruling the skies that the rules of the game changed. (Hah.) Baneslayer Angel proved that even if your guy is vulnerable to all sorts of removal, if your opponent doesn’t have it they can lose the game on the spot to a powerful creature. Goblin Rabblemaster is about as vulnerable as they come. He’s got no protection of any type. He offers no ‘on death’ trigger like Voice of Resurgence does to scare your opponent away from zapping him. With two toughness, any damage dealt beyond the absolute minimum possible will kill him. Clearly resiliency is not part of his selling point. How do past threats compare? Last season Pack Rat came down with only a single toughness yet was the scourge of Standard for something like nine months. Rat was even more vulnerable the turn he came down than Rabblemaster is. The flipside of that is that Rat became incredibly resilient as soon as you untapped. If your opponent didn’t kill Rat before you had a second, the copies he put into play made actually killing him nigh impossible. If you missed killing the single rat you had about a turn to sweep him away with Anger of the Gods, and if you missed that window, all that was left was a full-on sweeper such as Supreme Verdict. Loxodon Smiter was much tougher to kill. With four toughness he survived (and killed) any other creature in that mana range. There was close to no direct damage in the format that could take him down, and he was immune to Ultimate Price. As far as resiliency on a three-mana body, Smiter was well positioned relative to Rabblemaster. Smiter hung around the $3-$5 for a year or so, but ended up under $3 around the first of the year. Both Boros Reckoner and Nightveil Specter saw considerable success during their lifetimes, with Reckoner’s high point being a whopping $30 and Specter’s being $10-$12. Each had only one more toughness than Rabblemaster. Nightveil begged to be killed. Reckoner was a bit tougher because dealing damage to it meant that you or one of your creatures was eating the same damage back. Geist of Saint Traft was miserable to kill. Either you flashed in a blocker, had a sweeper in hand, resolved a sacrifice effect, or died to him. Geist reached $35 at one point, and was consistently more than $20. It seems like being highly resistant to removal isn’t a key component of being expensive, nor is resiliency automatically guaranteed to make a creature expensive. Survivability helps, for sure. But it won’t get a creature there on its own. T3: Cast Rabblemaster. Make token, swing for 1. 19. T4: Make 2nd token. Swing for 2 with tokens, 4 with Rabblemaster. 13. T5: Make 3rd token. Swing for 3 with tokens, 5 with Rabblemaster. 5. An uninterrupted Rabblemaster will kill within four turns, counting the turn you cast it. How do other creatures compare? Our takeaway here is that Rabblemaster kills real fast. He kills on turn six, which only Pack Rat is faster than. Pack Rat has the caveat that he required mana and cards every turn to be lethal. Most creatures simply can’t kill this quickly, especially without any assistance whatsoever. A 4/4s for three is a full two turns slower. Geist of Saint Traft was close, and if you score two extra damage anywhere along the way he kills in four. Of course, if you manage to get five extra in with Rabbelmaster, it’s a three turn kill. While I didn’t list him above, Tarmogoyf represents a similarly brutal clock. If you can get your Goyf up to 4/5 or 5/6 on turn three, you can kill by T6 or T7. Clearly you’re not often going to be able to cast a three-mana 2/2 and have your opponent spend the entire rest of the game just drooling on their cards. For the most part, you’ll be fighting for board control and not attacking with Rabblemaster every turn. The point isn’t to evaluate board states though, as those can be complicated and unique. Rather, we want to understand how quickly our threat is capable of killing the opponent in a vacuum. The reason for this is that while you often can’t attack unimpeded every turn, you can usually buy yourself a turn or two. How much ground can you cover on these turns? A removal spell on T4 on your opponent’s Courser following Rabble on T3 puts them at 13 already. That’s a lot of pressure that can force them to play the next few turns suboptimally in an attempt to survive. There are also the situations where you’re both in topdeck mode around turn ten that you draw Rabble and slam him. Depending on life totals, Rabble can represent lethal the next turn late in the game. In looking at this, it seems like killing speed may be a factor to consider. Pack Rat took over Standard for months and is one of the fastest kills in Standard in awhile. It isn’t quite a fair comparison though, because he requires a card and all your mana every turn thereafter. Rabblemaster is the fastest card I’m seeing that doesn’t require any additional input. Geist of Saint Traft is similar, and that was ludicrously expensive. 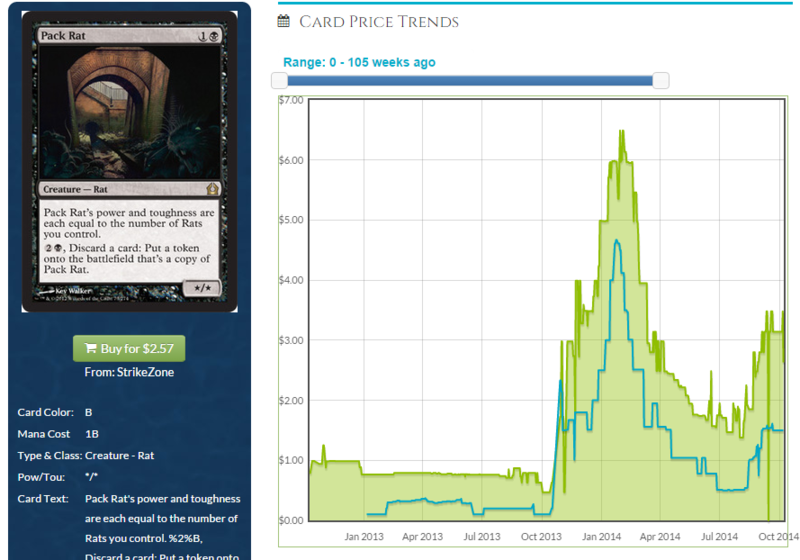 Tarmogoyf is similarly quick, coming down on turn two, and we all know the number on that guy. Other major threats have been comparatively slow. Boros Reckoner obviously wasn’t $20 because of how fast he killed, so clearly this isn’t the only thing to look at. It does seem that very fast zero-to-dead creatures have a considerable leg up though. I think this may quietly be one of the most important aspects of a creature spiking in price. Rabblemaster’s mana cost is real simple: 2R. A single R in the cost means he’s about as easy to cast as possible. With only a single colored mana in the cost, your mana requirements are light: be able to produce R by turn three. In contrast, 1RR is significantly tougher. 1RR means that 2/3rds of your lands need to produce R by turn three, which puts a much tougher strain on your manabase. Any deck planning on casting a 1RR spell on T3 is going to be heavily red, whereas hitting 2R is almost an afterthought. Consider also something like the 1GW found on Smiter. This is easier than 1RR, and while reasonably easy to hit on T3 for any deck playing it, it presents another challenge: your deck must be capable of producing two colors. Even though hitting two different colors by T3 is easier than double of one color in most decks, you’re still forced into playing a manabase that can reliably generate both. What impact does this have? Consider the twenty-five different one, two, and three color combinations in Magic. Let’s take a look at where a spell costing only R can go. As you can see, being a single color instead of two nearly triples the amount of decks a card can see play in. Three-color creatures? Beyond decks with the greediest manabases, they fit into only a single wedge or shard. Looking back at some of those creatures from earlier, we see Pack Rat at 1B. He’s another member of the mono-cost club. Smiter was two colors and was cheap, while Reckoner was…sort of? two colors and was expensive. Tarmogoyf at 1G is $200, Geist was $30 at 1UW, and Demon is 2BB. Both the mana costs and dollar values are across the board. We have expensive cards in multiple colors, while Pack Rat was a single color and was only $6. What’s the takeaway here? Being restricted to less decks doesn’t prevent a card from being valuable. Being mono-colored doesn’t mean a card will be expensive. However, being a single color definitely helps set the creature up for success. Any good #mtgfinance enthusiast knows that the more decks a card is playable in, the higher the ceiling. Siege Rhino is damn powerful, but you can only play it in one Standard deck. Even if Rabblemaster is slightly less powerful (which I’m not claiming it is), it can show up in eleven times more color combinations. More potential homes means more people that need copies, which means a higher price. I think our lesson here is that an easy mana cost doesn’t guarantee a high price, but it does allow for a higher potential price ceiling than a CDE card. This next one isn’t about what’s written on the card, but rather, the environment it’s been printed in. Rabblemaster comes from Magic 2015, the most recent core set. While we don’t have hard numbers, the community has a pretty good feel for the relative sales. Core sets sell less boxes than basically any other set in Magic. They were Standard-legal for the shortest period of time, the draft environment typically wasn’t too deep, and the set was light on tournament staples. Not only were these all factors, but the timing of core set releases has been in line with the lowest player turnout at tournaments. With such a small amount of product being opened, it’s unsurprising that breakout singles can jump hard in price. Pack Rat was a major part of Standard, but he was in a fall set, typically the most opened set in a block. Desecration Demon was too, although his price was about double that of Rat. Part of that may have been that Rat was in an event deck. Smiter was in Return to Ravnica, same as Pack Rat. Geist of Saint Traft was in a fall set – but as a mythic rare. Boros Reckoner was printed in a winter set, and a relatively unpopular one at that. I’m sure there was more Gatecrash opened than M15, but I can’t say by how much. The amount of M15 product on the market suffered even moreso than usual because of MTGO forcing players to V4 around the same time. With the switch from one garbage MTGO client to another garbage MTGO client driving players away, the amount of set redemptions dropped. Again, it’s hard to say by how much, but there’s definitely an effect. Of course Rabblemaster was also a Buy-a-Box promo, so the number of copies in circulation is higher than possibly any other rare in the set. Even still, a low-selling set combined with an unusually small amount of set redemptions may have been a strong contributing factor to his price surge. We can see set printing making a difference for other cards as well. Voice of Resurgence was considered to be overpriced for basically its entire time in Standard. The reason was not because the card was lighting Standard on fire for months at a time, but more that barely any Dragon’s Maze was opened because the set sucked. On the flip side, even heavily-played fall-set cards have trouble maintaining high prices simply because of how many copies are on the market. Availability of product is basically an invisible statistic. We can visit MTGPrice to see how much a card costs, or one of a variety of tournament tracking sites to see what cards are performing where, but there is no tool to see how many copies of a card is on the market. The amount of given product on the market, along with what player demos are generating demand for a card, are invisible to the average consumer. It’s guys like myself and other writers that have some amount of perspective on the situation, although admittedly it’s still all just educated guesses. The amount of product in a market has a large impact on price. The tough part is figuring out how much is actually out there, and what that will translate to in terms of prices. The last feature we’ll look at today is where Rabblemaster is where demand is coming from relative to other creatures. A card like Snapcaster sees play in nearly every format. How about Rabblemaster? That’s it. He’s not in Legacy or Modern, although he may get there at some point. He’s not particularly exciting in EDH. There’s probably some casual players that want him as he’s tribal, but I doubt it’s any meaningful amount of demand. 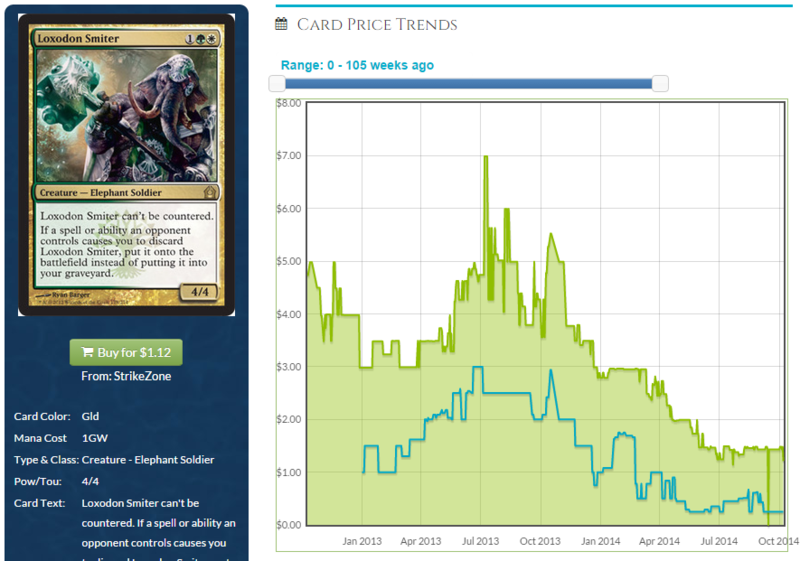 No, it seems like Rabblemaster is driven almost entirely by Standard. Loxodon Smiter was mostly Standard demand, although there was some Modern splashed in there too. Certainly no EDH or casual. Snapcaster Mage was and is played in every format. I’m guessing there’s no casual demand here either, but his presence in competitive play is unquestionable. In the last three years he was as high as $40, although he’s spent most of his time between $25 and $30. Pack Rat was overwhelmingly Standard. There’s a splash of Modern in there but that’s about it. Desecration Demon was nearly exclusively Standard. Geist of Saint Traft was a big Standard player, but has also seen moderate success in Modern, and mild play in Legacy. Geist was a big part of Modern a year or two ago, but he’s been on the downswing lately. Boros Reckoner and Nightveil Specter were exclusively Standard cards. Deathrite Shaman saw very little Standard play before rotation, yet saw a meteoric rise and eventual post-ban crash within two years. He was near $20 at his height, and was close to $15 until he was banned. Those are impressive numbers for a fall-set rare with absolutely zero Standard demand. Looking back at this cross-section of creatures it seems like the major driving force behind price for a Standard-legal card is Standard. Other formats can certainly have an impact, as cards like Deathrite Shaman prove. 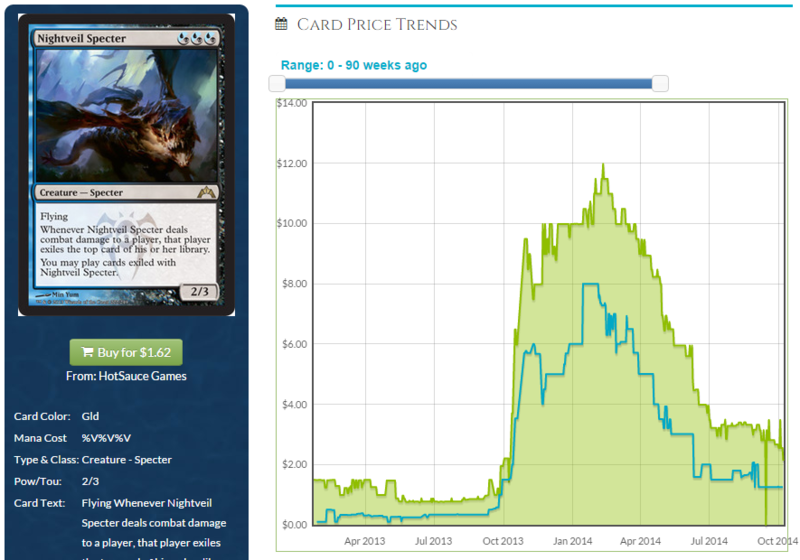 However it’s very tough for Modern and Legacy to drive high prices on Standard cards while they’re still legal. It’s even tougher for EDH and casual markets to do it. Once cards rotate then the other formats can begin applying pressure. Until then though, most cards live and die by Standard demand. In order for a card to be worth a good chunk of change while it’s in Standard but have no actual Standard demand, it has to be a format-changer in both Modern and Legacy, just like Deathrite Shaman was. 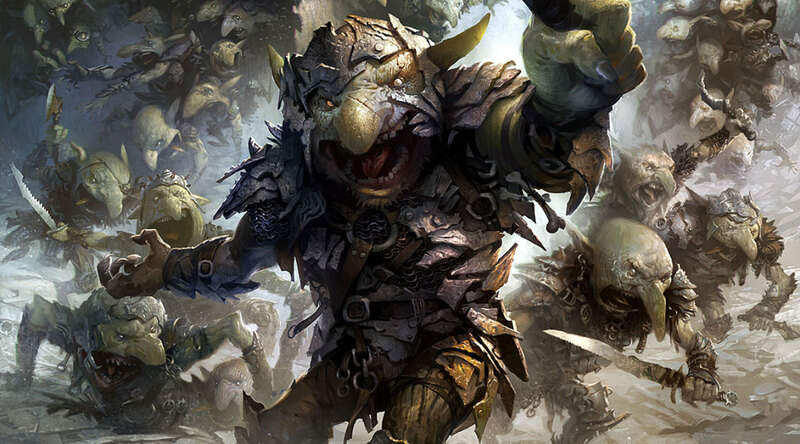 We looked at several traits of Goblin Rabblemaster and compared them to a swath of other recent creatures that have passed through Standard. We talked about resiliency, speed, mana cost, availability, and format demand. All of those factors certainly play a role, although not all equally. Given what we’ve seen so far, it seems like Standard demand may be the single most important factor when deciding a creature’s price. Being a major player in Standard is going to set the stage for big price tags. There’s certainly more to it than that though. Format demand is important, but it really just opens the door to high prices. From what I can tell, mana cost and ability to kill an opponent are the next biggest factors. No matter how good a card is, if it’s three colors, it just has so many fewer homes than a card with a single color. A joke amongst players of older formats is that to make any deck better, splash green and play Tarmogoyf. A powerful card with light mana requirements can find many homes, which is exactly what is happening with Rabblemaster. Killing people dead is the other big driver of prices. If you’re able to put your opponent at nearly-dead on turn five after playing a creature and two removal spells, that is one solid threat. Pack Rat was wildly successful because of how quickly it could kill in tandem with Mutavault, and Geist of Saint Traft was a big player during his time as well. I firmly believe that had Pack Rat been from any other set or was mythic, his price would have been easily close to $20. Card availability is important as well, but like format demand, it’s more about unlocking potential rather than pushing prices itself. Simply having few copies of a card in the market is not going to make it expensive. Having few copies of a card in the market along with being powerful on some of those other vectors is what is really going to drive the price. On the flip side of this is a card like Pack Rat. It had everything going for it, but the quantity in the market put too much pressure on its price. Finally, resiliency doesn’t seem to matter one bit. A creature that is tough-to-kill is definitely helpful, but we’re past the days where it’s a key feature. If you jam your deck full of powerful threats, eventually your opponent isn’t going to be able to kill one. That’s the one that will get there, even if it is just a 2/2. What’s the takeaway from all this? When evaluating creatures for potential price spikes, ask yourself a few questions. What set was this printed in, and how much of it is out there compared to other sets? What format is going to want this card? Do I want to spec on it because of Modern, or is this going to be a Standard player? What’s the mana cost? How many different types of decks can play it? If I play this onto an empty board on-curve, how quickly will it kill them? Will one or two swings put them precariously low, or do I have to swing five or six times? All of this relates to creatures that get your opponent dead, of course. Cards like Sylvan Caryatid or Courser of Kruphix play by a different set of rules because they fill different roles. Those are utility creatures, and are definitely tougher to understand. I hope you found our discussion of Rabblemaster today helpful. Be sure to check out my article series from last two weeks about the structural flaw in MTGO’s trading market, and stay tuned this coming weekend for Pro Tour Khans of Tarkir. I’m sure all sorts of wild prices swings will be happening because of it, especially Friday afternoon as people figure out which decks the pros landed on are actually good. Glad you like it Jonathan. I would definitely sell any extras you have. There isn’t much room for it to grow, but there’s a lot of room for it to fall. I’d take my profits and put them somewhere more lucrative. Speed and playability are very related, but I put them separate because some cards are almost non-playable by themselves (Emrakul), but they combo extremely well with other cards. I think a specific card combo certainly has an effect on pricing, but I don’t want it anywhere near top tier in terms of card value. I stand firmly by the fact that limited printing is the top tier reason why a card would have value (Jace, Memory Adept – media insert version). Nice thoughts on the Rabblemaster. I recently got back to MTG after a 10-year hiatus. And pretty much, I was amazed with the number of changes that WTOC has made onto the game play. I think it has improved to some point. Regarding the Rabblemaster, I agree that there won’t be much growth to it. After all, once it hits rotation, modern there would be other cards taking over, so pray for a reprint or something. Unless WTOC finds the idea unappealing and decides to go for the almost same effect on another color. But always a wishful thinking. When I got my rabble master, I immediately traded it for something else. I still believe that it is too vulnerable to keep in the game. Pretty much the landscape now is all about creatures. And suvivalibility is always my priority. Anyway, I’ve been thinking of making a deck out of Altar of the Brood. Can you write a post about it. I personally think that it’s an underrated card. Rabblemaster is pretty insane, but I think a lot is hype from the Jeskai Tempo deck that won the SCG Open. I beat that deck at a fnm recently using Merriam’s mono-green doomwake. I was more than happy to trade a mystic + voyaging satyr for his rabblemaster on turn 4. Because once mono-green gets going, tempo aint stopping anything.